Well-traveled outfielder Jose Guillen is a Royal for 3 years at $36 million. The Braves and Cubs swapped spare parts. The Yankees decreed they were pulling out of the Santana sweepstakes, only to find that the Twins called their bluff. The Angels were reportedly in the mix for Santana but Halos-GM Tony Reagins is currently denying any link to the southpaw. …then, like the drunk guys who took your seat while you were getting a hot dog, the Marlins and Tigers decide to shake things up in a real big way. The second-biggest name on the trade market—Miguel Cabrera—and teammate Dontrelle Willis were shipped to the Tigers in exchange for elite prospects outfielder Cameron Maybin, lefty starter Andrew Miller. Also heading to Florida will be catcher Mike Rabello, and pitchers Dallas Trahern, Eulogio De La Cruz and Burke Badenhop. This trade is huge for both sides and immediately sends shockwaves through the rest of the American League. The Tigers have to be considered neck-and-neck with the Red Sox in terms of who will be the favorite heading into the 2008 season. That could all change if the Sox wrangle Santana away from the Twins—a move that seems increasingly more necessary for anyone looking to tangle with the new-look Tigers. Call me crazy, but that’s a pretty potent lineup; perhaps even more so than that of the Yankees and Red Sox; and definitely more potent than that of the Indians or the Miguel Cabrera-less Angels. This move also opens the Tigers up to the option of trading incumbent third-baseman, Brandon Inge. With many teams in the hunt for third-basemen and the top dog now off the market, perhaps the Angels, Dodgers or even the division rival Twins would be willing to talk. Perhaps a trade of Inge and Chad Durbin to the Twins for Joe Nathan, if the Twins do—in fact—intend to trade him as well. Moving on from the All-Star Game lineup the Tigers will be putting on the field everyday, let’s turn to their rotation. At the helm are the three faces of the future Willis, Jeremy Bonderman and Justin Verlander all of whom are 25 or younger heading into this season. Also in the mix are veteran southpaws Kenny Rogers and Nate Robertson. Assuming Willis is able to turn-around his recent regression—something many believe to be the result of large workloads in recent years—he could return to form as the pitcher who won 22 games as recently as 2005. The only real weakness the Tigers currently possess is the mystery surrounding the back end of the bullpen. Joel Zumaya is out until mid-season and closer-by-default Todd Jones is, well, Todd Jones. How much magic can that dude really have left? Despite that lone weakness the 2008 Tigers look to be a very talented team which means trouble for the rest of the American League. As much as I don’t want to mention that this move was a salary dump for the Marlins, it was—by all means—a salary dump for the Marlins. With arbitration not treating the Marlins kindly the salaries for Willis and Cabrera were quickly escalating and only figured to continue the trend, as such the move makes a lot of sense. In adding Maybin the team adds a very young, very athletic five-tool player who can finally take a firm hold on the centerfield job and help cover the ground that fellow outfielders Jeremy Hermidia and Josh Willingham can’t. Maybin has been compared to Ken Griffey Jr on numerous occasions because of his blazing speed, incredible defense and his ability to hammer the ball. His presence alongside Hanley Ramirez at the top of the Marlins lineup will give opposing teams fits on the base-paths all season long. 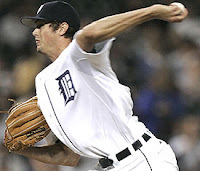 Miller was taken 6th overall in the 2006 draft by the Tigers and he is widely regarded as the best pitcher from that draft which was laden with quality pitchers. The 6-foot-6 southpaw has only pitched 16 games in the Minors, and it’s doubtful he’ll spend any more time there now. His pitches include a mid to upper 90s fastball, a late-breaking slider and a change-up. Pitching coach Mark Wiley was recently rehired by the Marlins, due to his reputation for handling young pitchers well; a move that could be a very beneficial for Miller and the Marlins. The addition of Mike Rabello gives the Marlins a second option at catcher and the addition of three minor league arms only adds to the Marlins seemingly limitless supply of solid, young pitching. Although the Marlins don’t look to contend any time in the near future, this trade sets the groundwork for the next five plus years. With young pitching and a very dynamic offense, this is a team that may only be a few quality parts away from contention. However, as if seemingly the way in South Florida, that isn’t likely to happen without new ownership, a new stadium or perhaps a move to a new locale. Fiscal elements notwithstanding, the talent factor is there, now it’s all about putting it together.